A cultivar of Camellia japonica L. ‘Flower cherry red 6.5cm across, regular, 15-20 petals, sometimes marked white like those of ‘Coccinea’ and spirally arranged.’ [Berlèse Iconographie pl.53/1841-43, quoted in the ICR]. 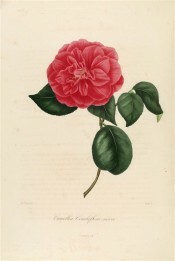 It was listed in Loddiges’ nursery catalogue, 1832 [ICR] but not in 1836 [CPA]. Desideratum to Loddiges’ nursery on the 6th January 1845. Not recorded as received and there are no further records. [MP A2933-2, p.28].